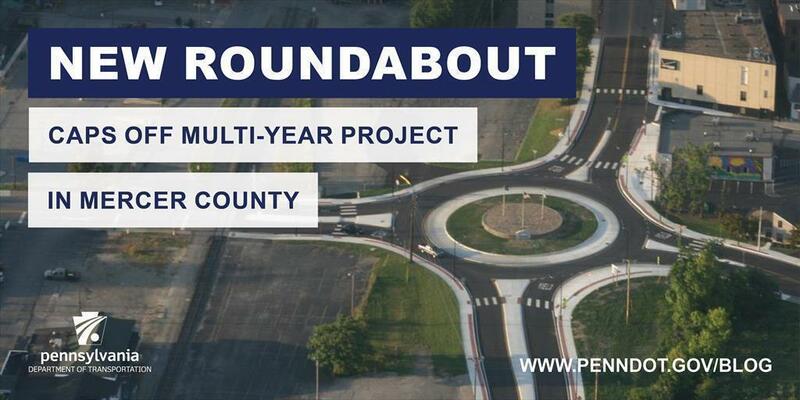 Earlier this year, Erie County-based District 1 opened a single-lane roundabout as the final, major piece of PennDOT’s six-year, $28.1 million project focused on improving safety, efficiency, and the streetscape of the Route 718/Route 760 corridor in the Mercer County communities of Wheatland, Farrell, and Sharon. Known as the Broadway Avenue Improvement Project, work started in 2012 and was completed in three phases. Phase 1 (2012-2013) – Completed in two stages on Broadway Avenue/Martin Luther King Jr. Boulevard at a cost of approximately $9.2 million. Stage one went from Council Avenue in Wheatland to Fruit Avenue in Farrell. Stage two went from Fruit Avenue in Farrell to Roemer Boulevard in Farrell. Phase 2 (2015-2016) – Completed in three stages on Martin Luther King Jr. Boulevard at a cost of approximately $7.3 million. Stage one went from Roemer Boulevard in Farrell to Union Street in Farrell. Stages two and three went from Union Street in Farrell to Malleable Street in Sharon. Phase 3 (2017-2018) – Completed in two stages at a cost of approximately $4.1 million. Stage one involved the area of South Dock Street from Orchard Street to the entrance of the Metalico recycling plant. Stage two went from the recycling plant to Bank Place and included the construction of a roundabout at the intersection of South Dock Street and Connelly Boulevard. The work also included streetscape upgrades to drainage, traffic signals, decorative highway lighting, signs, as well as pear tree plantings. Kirila Contractors Inc. of Brookfield, Ohio, was the contractor for all three phases of the project. SAI Consulting Engineers of Pittsburgh was the design consultant, and Quality Engineering Solutions of Conneaut Lake, Pa., was the inspection contractor. Design and inspection costs for the six-year project were approximately $7.6 million. PennDOT marked the opening of the roundabout by partnering with the Shenango Valley Chamber of Commerce to host a public ceremony and ribbon cutting.